In the context of globalisation and the current global financial crisis, new players are emerging in cooperation in Africa. These partners loosen financial constraints and conditionalities, increase the room for manoeuvre and stimulate commodity markets. On the other hand, they also increase the risks of renewed indebtedness and potentially weaken the coordination of aid policies. Do these partnerships call the new cooperation practices of OECD countries into question? Do they justify the return to a realpolitik or are they repeating the earlier mistakes of industrial powers? Can these mistakes be corrected? The question also arises as to whether the global crisis, which has a profound effect on Africa, will lead to a withdrawal or to a passing of the baton on to new, emerging powers. This article highlights the new geopolitical issues concerning Africa in a multipolar world, then discusses the new players involved in cooperation in Africa, before going on to explore the horizons that are opening up for cooperation in Africa, in particular with regard to the global crisis. 3.3.3. China: a “win-win” relationship? 4.1. The new partnerships: an opportunity or a risk for Africa? 4.2. Emerging countries to pick up the baton or to withdraw in the context of the crisis in Africa? 4.3. The new players in cooperation: rivals or complements to the old players? 1International cooperation, or the joint action of several players from the international community, is different to the vertical concept of development aid. However, we will assimilate them for the purposes of this article. Aid provides finance, capacity development and technology to poor countries which find it difficult to access private finance. Yet, the effectiveness of aid is impeded by low levels of absorption and it creates perverse effects such as a bias towards capital-intensive projects and recurrent costs (Gabas 2005). It is often diverted from its goals and its multiplier effects are limited (for an input of 100 units, only 60 come out immediately). The debate between trade and aid has been a permanent fixture since the Second World War. 3In this new context growing relationships are being cemented with emerging players in African development cooperation, in particular with China. These partners loosen financial constraints and conditionalities, increase the room for manoeuvre and stimulate commodity markets. On the other hand, they also increase the risks of a renewed debt cycle and could potentially weaken the coordination of aid policies. Do these relationships call the new cooperation practices of Organisation for Economic Co-operation and Development (OECD) countries into question? Do they justify the return to a realpolitik or are they repeating the earlier mistakes of industrial powers? Can these mistakes be corrected? The question also arises as to whether the global crisis, which has a profound effect on Africa, will lead to a withdrawal or, on the contrary, to a takeover by emerging powers. 4This article highlights the new geopolitical challenges facing Africa in a multipolar world. It then turns to the new players involved in cooperation in Africa, before exploring new horizons that are opening up for cooperation in Africa, in particular in light of the global crisis. 5The new world context calls into question the paradigms upon which North-South relationships were founded (Hugon and Michalet 2007). For dependency theorists, the peripheries have suffered from stilted accumulation and unequal exchange. According to neo-liberal analyses, the savings deficit in the South must be compensated for by foreign investment and trade. And yet, before the current crisis broke out, a noticeable shift of the centre of gravity of global capitalism towards South and East Asia and the Middle East in particular occurred. Of course, the West remains dominant in technological and military fields. However, emerging economic and financial powers are also becoming political and military powers. They accentuate competition for non-renewable resources (fossil fuels such as hydrocarbons, for example). Starting with China, they have accumulated currency reserves and have generated savings surpluses. Parag Khanna (2008) illustrates how the emerging Second World is playing as important a role as the American hyperpower and the First World in reshaping the global political playing field. 6Several structural transformations have profoundly changed the role of ODA in development. Financial globalisation, characterised by market fragmentation and significant deregulation, has favoured access to capital by emerging countries and has considerably increased the role of private sources at the expense of public ones. The extension of outsourcing to countries with low labour costs and advanced technologies has altered the roles of different countries in international trade and in foreign direct investment (FDI). The geographical origins of multinational firms, which represent one-third of worldwide production and two-thirds of worldwide trade, have become diversified.3 Foreign trade is becoming more and more concentrated on intermediate goods, high-technology products and services. An erosion of trade preferences can be observed within the World Trade Organization (WTO), including those which benefited Africa. On the other hand, a reduction in importance of commodities, apart from hydrocarbons, can also be noted. The added value tends to shift further downstream in these sectors. As a result, new dynamic centres have emerged. In terms of Purchasing Power Parity (PPP) the countries in the South currently represent half of worldwide gross domestic product (GDP). Brazil, Russia, India and China make up one-third of global GDP and their relative importance has increased with the global crisis. 7Since independence Africa’s place in the international division of labour has changed little. The continent largely remains an exporter of non-processed raw materials, whose unstable prices have a tendency to depreciate, and an importer of manufactured products and services and even food products. However, with the advent of globalisation and the emergence of new powers, an inversion in the terms of this exchange was apparent at the turn of the 21st century, favouring African growth and an increasing appetite of emerging countries for natural mining and oil resources and even for African arable land. Africa is now coveted by emerging powers and also by industrial powers for its resources (biodiversity, forests, hydrocarbons, mines, arable lands) and for a market that, from 900 million people in 2010, should reach two billion people in 2050. 8The continent of Africa represents 12% of worldwide oil production and 10% of proven worldwide reserves. The United States (US) imports 60% of African oil (this constitutes more than 90% of African exports to the US), compared with 20% for China (more than 60% of exports to China) and the European Union (EU) each (see table 1). 9Many African countries have become oil producers as a result of the technological progress made in prospection and exploitation, anticipation of an increase in demand and the risk diversification strategies of operators and oil-importing States. The main producers are Nigeria, Algeria and Angola (see table 2). Notice: — = missing data. Abbreviations used in the table:t: tonne; b/d: barrels per day. 10The European powers, i.e. France with Elf (now Total) and Great Britain and the Netherlands with BP and Shell, have for a long time dominated the oil industry in the former colonies. France has sought to establish energy autonomy for itself. The post-colonial context of exclusive territories and apparent relationships between the French government, Elf and the military has disappeared, or it has, at least, changed greatly. The situation has become more complex and less transparent with the arrival of new players, notably Chinese, seeking to establish a presence in these territories through diverse practices (barter agreements, interest-free loans, payment in kind).4 Africa is, therefore, a competitive arena for oligopolies in a context that is now globalised. Sources:Rosellini (2005) and the French Embassy in Cameroon (2008). Abbreviations used in the table:b/d: barrels per day; PSC: Production-Sharing Contract. 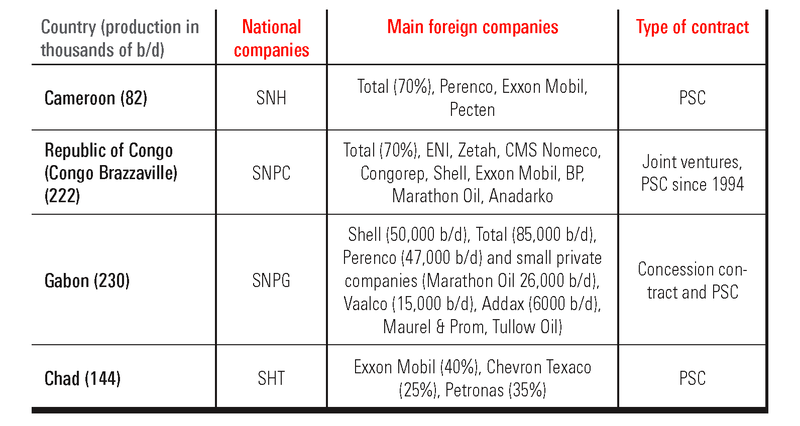 Country of origin of operators: Total, Maurel & Prom: France; Exxon Mobil, Chevron Texaco, Marathon Oil: US; Petronas: Malaysia; Shell: Great Britain and the Netherlands. 11The great powers are spearheading a policy of diversification of world supply. Overall, Europe buys 22% of its oil from Africa. The US has adopted a strategy of diversification of hydrocarbons suppliers and hopes to obtain 25% of its supply from Africa in 2015, compared to 17% currently. China imports more than 20% of its oil from Africa, notably from Angola and Sudan. China has a presence in almost all hydrocarbons-producing countries. India is also present in several countries in Africa. 12Similar strategic stakes can be seen for certain mined products, and particularly for uranium in Niger and Namibia, coltan in the Kivu region in the Democratic Republic of Congo (DRC) and cobalt, but also for iron, manganese, copper, gold, diamonds, chromium and bauxite, for which there is great demand in emerging countries, led by China. For example, Chinese financing of infrastructure in Katanga in the DRC is directly linked to mining areas and often creates enclaves rather than centres of development. 13The politics of cooperation cannot be reduced to utilitarian objectives. Emerging powers use active diplomacy and have diversified their alliances, especially with African countries. For their part, the latter have also turned dependencies and one-upmanship between foreign powers into a strategic resource. What happens in Africa has global implications in terms of climate change, biodiversity, preservation of natural resources, epidemiological and security risks, which concern more and more emerging countries in addition to the countries that are members of the OECD’s Development Assistance Committee (DAC). At the forefront are the security risks and the risks associated with the proliferation of “global public health problems” such as malaria, human immunodeficiency virus/acquired immune deficiency syndrome (HIV/AIDS), drugs and arms trafficking, piracy and even terrorism. The 53 African States have become important allies in terms of voting and negotiations within international organisations. 14Cooperation and aid relationships have evolved considerably in this new geopolitical context. Africa is diversifying its partners and has access to new financing from emerging countries and oil producers. Influential and powerful relationships run through channels of trade and finance, religion, diasporas and non-governmental organisations, and not only through the hard power of military capabilities and interventions. An updating of historical links between large African zones and areas of influence can also be seen, between Indians and Ismailians in West Africa and in the Indian Ocean, between North African countries and the Middle East in the Muslim Sudanese-Sahelian zones, not forgetting the general presence of China, in the Red Sea in particular, nor that of the US in the Gulf of Guinea. Even though the DAC countries are still the main sources of aid, other major players are appearing. However, it is difficult to evaluate the precise amount of this aid because, on one hand, it is not centralised, unlike that from DAC countries, and, on the other hand, it comes in many forms such as barter agreements and loans at unknown rates (see Afrique contemporaine 2008 and Michel and Beuret 2009). While multilateral and aid coordination policies have become centralised for Western powers through the International Monetary Fund (IMF), World Bank, OECD or EU, the new partners engage mainly in bilateral relationships with African countries. 15We will consider the examples of two great colonial powers: France and Great Britain. 17France is caught in a dilemma. Should it intervene, and be accused of interference, or just leave things to happen, which could be seen as indifference or even acceptance of the worst, as in the case of the Rwandan genocide? “Franco-African” networks and the umbilical cord have been too durable for there not to be any hidden agenda. Renegotiations of defence agreements are ongoing. Late decolonisation is a source of resentment. The French case-by-case policy, which is on the defensive faced with the dreaded dominance of the Anglophone world and is ambiguous in its discourse about countries that are not ready for democracy, is the subject of fierce criticism from public opinion and certain African powers. 18Great Britain has a long tradition with Africa but had not adopted a real policy towards the continent since independence. Attempts were diluted by links within the Commonwealth, which receives the bulk of British aid, and relations were principally maintained with Nigeria and South Africa. The situation fundamentally changed following the rise to government of Tony Blair in 1997 and his New Labour policies. Therefore, military intervention in Sierra Leone in May 2000 marked a turning point in British policy. This is also reminiscent of the former Empire. Opposition to Robert Mugabe passed through Commonwealth channels. Foreign policy is seen to have an ethical content alongside a realpolitik. The weight of civil society and the churches is important in this new policy, which is now reinforced along two main axes: cooperation policy and increased aid.7 Africa appears to be a major strategic issue on a geopolitical level, with priority given to Least Developed Countries (LDCs). British policy seeks to reconcile global ethics, self-interest and principles of economic liberalism (see Coalition pour l’Afrique 2005, ECDPM 2009 and ODI 2009). 19Progressively, the EU has partially picked up the baton of former colonial powers. It distinguishes between its relationships with northern Africa, via the Euromed Agreements, South Africa, via free trade agreements (FTAs), and the countries of the Africa, Caribbean and Pacific (ACP) zone via the Cotonou Agreement. Its four objectives are: peace and security; good governance; commercial integration and trade; development. The EU intervenes in Africa primarily through partnership, multilateralism, hands-on diplomacy and soft power. 21European policies lack consistency between trade, agriculture and development. Consider the case of the EU’s Common Agricultural Policy which, by subsidising production and even exports, contradicts the financing of agricultural projects through the European Development Fund. Similarly, foreign trade agencies play a decisive role in the implementation of EPAs and FTAs, but they are at loggerheads with development agencies, which favour social and environmental factors, the productive sector and regional integration. European polices remain largely dependent on the policies of its member States. 23The expansion of the EU has been achieved at the expense of an African policy. In contrast to its opening up to Eastern European countries, Europe does not have a bold policy on Africa, despite the historical and geographic closeness to at least southern Africa (ECDPM 2009). 24The notion that “Africa is more a European problem than an American one” is less valid nowadays. There are ancient and direct links, in particular between African-Americans and Liberia. During the Cold War US foreign policy was primarily anti-Soviet. After the events in Somalia a “zero fatalities” policy was advocated and economic interests became predominant. Since 9/11 the US hyperpower has become active once more and it now pursues its policy based on three priorities: first, the war on terror and reinforced containment of Islamist movements through military assistance programmes; second, the strengthening of trade and increased oil investments (American imports from Africa should increase from 17% in 2008 to 25% in 2020), with American firms notably present in Somaliland, southern Sudan, Sahelian countries and the Gulf of Guinea; and third, the development of trade and aid based on liberalism.11 The US relies on pivotal States that have a regulatory capacity. The US is also looking for answers to the so-called asymmetrical risks occurring in conflicts between States, when States are failing and become a breeding ground for trafficking and in cases where technological superiority is not sufficient to combat terrorists. The aim is also to secure oilfields and maritime routes. By doing this, the US seeks to develop democracy and the market, relying on civilian resources in conjunction with military resources (civilianisation). The US thus engages inpreventative defence by shaping the environment through distribution of American norms, values and standards. 25The African Growth and Opportunity Act is designed to encourage the currently limited trade links between Africa and the US. This initiative mainly concerns oil and, to a lesser degree, textiles. Thirty-six African countries are officially eligible according to several criteria, i.e. they have to make continuous progress towards a market economy, respect trade laws and freedoms and implement policies to reduce poverty and protect workers’ rights. The US has reinforced its evangelical actions through private players and its military and diplomatic presence. 26Since 1989 relations with Russia have diminished, except for the new trade triangle whereby Russia exports arms to Africa, Africa exports raw materials to Europe and Europe exports manufactured products to Russia in exchange for gas. Since 2005 there has been a renewal in both energy interests (gas and nuclear) and geopolitical interests in an attempt to balance a multipolar world and to compete with China. The main links involve Egypt and South Africa, but also Namibia (uranium), Angola (diamonds, oil) and Nigeria (gas). Thus, Gazprom has access to gas resources in Nigeria with a view to supplying Europe with gas, Abrosa has diamonds in Angola and Rusoil has aluminium in Nigeria and in Guinea. 27China, India and Japan (the three great powers in Asia) do not play on the same playing field as the African nations. These three giants represent three times the volume of the population of Sub-Saharan Africa, their GDP is 14 times larger and their defence forces (in number of soldiers) is 30 times larger than those of the countries in that region. Their growth rates are more than twice those of Sub-Saharan Africa. The presence of these great Asian States in Africa can be largely explained by their trade diversification efforts, notably linked to their inclusion in the WTO. It is also associated with their substantial need for raw materials and energy as well as their emergence as powers on the international scene. 28Relations between Japan and Africa have become geostrategic once again. For a long time they were limited to trade, investment and aid, with Tokyo wanting to maintain a presence in certain markets and to have access to local commodity resources. Japan’s increased presence in Africa is also linked to its rivalry with China and a strategy of building a new axis of peace and security. Excluding South Africa, the share of Japanese trade with Africa represents less than 2% of all of Japan’s worldwide trade relationships combined.13 Japan has become the main donor to the African continent, committing itself during the Tokyo International Conference on African Development (TICAD) IV in 2008 to allocating USD 4 billion in ODA to Africa. Apart from geopolitical interests, such as garnering the support of African countries to obtain a permanent seat on the UN Security Council, the objectives of this cooperation remain primarily utilitarian, i.e. to obtain access to raw materials and to consolidate the presence of Japanese firms. Tokyo has also extended its support for conflict prevention. 29India is an emerging power in more than one sense, given its population, its strong economic growth, its strategy of openness, its performance in high-technology sectors and its military arsenal. Through its diaspora networks, India is present in East Africa (Kenya, Uganda), in South Africa and in the Indian Ocean (Madagascar, Mauritius).14 The country imports 70% of its oil requirements and forecasts of its increase in demand were evaluated by Indian authorities, before the 2008-09 crisis, to be close to 10% per year. Eight African countries (Burkina Faso, Chad, Côte d’Ivoire, Equatorial Guinea, Ghana, Guinea-Bissau, Mali and Senegal) have been involved, since March 2004, in the Team 9 Initiative (Techno-Economic Approach for Africa-India Movement) launched by the Indian government.15 Now linked to the US on an international relations level, India maintains geopolitical relations with Africa that are much less strategic than those that Africa has with China. Trade between India and Africa has increased five-fold in five years, reaching more than USD 30 billion in 2007. Technological transfers are also apparent (for example, the pan-African electronic network for tele-medicine and tele-education) as well as an outsourcing of some industries with the aim of gaining access to the European and North American markets. 31Even though its international strategy had remained discreet for a long time, China has positioned itself as a regional power in competition with the Nippo-American axis. It is both globalised through its integration into the WTO and regionalised through the networks of its diaspora, which has enabled it to extend its areas of influence. 32Relations between China and Africa are, essentially, economic and are officially based on the “win-win” principle as declared by the Chinese. One of China’s priorities is to ensure the security of trading and oil supply routes. The second largest consumer of oil in the world, China receives 30% of its supply from Africa (38 million tonnes out of 127 million tonnes in 2006).18 Some 85% of African exports to China come from Angola, DRC, Equatorial Guinea, Nigeria and Sudan. The share of African exports to China grew from 1.3% in 1995 to more than 15% in 2009. China has increased the number of African products that are exempt from customs duty from 190 to 4,000. Its need for raw materials (iron, timber, cotton, diamonds, copper, manganese) is considerable. In addition, China finds outlets in Africa for public works, telecommunications and textiles. China’s trade balance with Africa is slightly in deficit.19 More than half of China’s exports are products with high added value (machines, electronics, new technology), but it also sells cheap products, often of low quality, contraband or counterfeit.20 China’s influence is also felt in private and public financing. China has set up a special investment fund of USD 5 billion dollars for Africa, combining Western technology with low labour costs and Chinese public subsidies, notably in the telecommunications sector. Source: Chinese Ministry of Trade, 2007. Notice: — = missing data. 33The Chinese global strategy depends on public power and also on a multiplicity of “bottom-up” actions, which depend on private players but which are favoured by the State (Marchal 2008). A distinction must be made between presence due to State strategy and presence as a result of migrations and the rationale of the diaspora. Chinese people associated with Chinese official aid and policies, and those who work for public enterprises, must be distinguished from those who have migrated thanks to the diaspora and who work in the private sector (Chaponnière 2008). Unlike the big public projects, especially in building and public works industries, the Chinese production sector mainly uses local labour, to the tune of over 90% for public businesses and over 65% for private businesses in Mali and in Benin (Dupré and Shi 2008). There is clear competition with the African players, but in terms of the distribution of Chinese products just as many African or European businessmen as Chinese ones are involved. Most supplies pass through Dubai. 34Political and cooperation relationships betweenChina and Africa support a realpolitik point of view. Cooperation is diplomatic, cultural, medical and military and it is exempt from political conditions. It separates economic interests from political reform. Estimating Chinese aid is very difficult (Guérin 2008). This remains a small amount, favouring infrastructure projects, and is not subject to evaluation. Consistent time series are not available, and neither concrete payments nor the methods used to quantify aid given in kind or through technical advice are known. Aid projects are often integrated into investment or trade projects. The three aid modalities are subsidised loans, joint-venture projects and grants. It appears that loans are quickly granted but, on the whole, appropriation of projects is low. The number of Chinese involved in cooperation in Africa is estimated at 60,000.According to the IMF (2009), Chinese aid in Africa rose from USD 310 million in 1989-92 to USD 1 billion in 2006 (plus USD 1.3 billion in debt reduction). It was estimated at USD 5 billion in 2008. This aid comes from many sources and is increasing greatly. In general, it “only” demands the non-recognition of Taiwan in return. The share of aid destined for Africa is evaluated at 45%. China relies on African States to prevent Japan from joining the UN Security Council. Some 10,000 Africans are trained every year in China. 35China is not respectful of human rights or social and environmental standards. In fact, China accepts 60% of logging products exported by Africa which do not meet environmental standards. Relations are forged outside international regulations, marked, for instance, by interest-free loans and the role that Chinese public enterprises play in the political decisions of the State. China uses its position of strength within the UN to protect friendly nations in a “Third World” manner, by which poor countries share a common interest against Western powers without the interference of any colonial past. This enables some African countries (Côte d’Ivoire, Sudan and Zimbabwe) to avoid international sanctions. It could be considered that the arms sales made and the support given to certain “rogue States” by China have contributed to fuelling armed conflict in Africa (in Angola, Chad, Ethiopia and Sudan). China has developed its military relations with Africa considerably. On the other hand, China’s powerful role forces it to apply the rules of the international community more and more. It has also contributed to the establishment of a peacekeeping force in Darfur, after having opposed this with a veto in the UN Security Council for a long time. China suffers the consequences of maritime piracy and receives criticism from the Organisation of the Islamic Conference (OIC) and Turkey and threats from Al-Qaeda following its actions against the Uyghurs in July 2009. 36China’s honeymoon with the black continent, which gives the latter a financial lifeline and diversifies partnerships, is not without ecological and social risks, nor potential discontent associated with too great a presence of Chinese people (more than 750,000). Although agreements have been reached with African decision-makers to put democracy into perspective, there are other issues to be considered, including culture clash, the dichotomy between work rhythms, absenteeism among workers, the rejection of small colonies and a lack of mixed marriages (with the historically grounded exception of Madagascar). 37On the whole, economic relations between Africa and Asia can be seen to be, except for South Africa, post-colonial in nature. Africa is still a reservoir of raw materials and a spillway for manufactured products. India and China are harnessing the competitive products of new African specialisations (textiles, food processing). Of course, other Asian countries are interested in African markets, in particular Malaysia (oil) and Indonesia. 38Links between Africa and Latin America, anchored in memories of slavery, have undergone many changes since independence. Cuba played an important role in the Cold War by supporting countries on the front line (in southern Africa) and, in association with the Soviet Union, the socialist States. Nowadays new deals have led to an important role for emerging countries such as Brazil. Brazil recognises its “slavery” debt to Africa, has close relationships with Portuguese-speaking countries and wants, like South Africa, to play a part on the new international scene. The value of trade between Brazil and Africa tripled between 2002 and 2008. South Africa and Nigeria receive 82% of total exports from Brazil to the continent. Some channels are also criminal in nature. Drugs from Colombia, either directly or indirectly (via Brazil or Venezuela), go through West Africa (primarily Benin, Cape Verde, Ghana, Guinea-Bissau, Mauritania, Nigeria and Senegal) and South Africa to Europe. These channels feed conflicts in themselves (for example, in Guinea-Bissau). 39The Arab oil-producing countries (mainly Saudi Arabia and the United Arab Emirates) and Iran play an increasingly significant role in the context of important oil considerations, financing ability and also the increased power of religion. Most of this support involves Muslim Africa. Links pass through official channels (for example, the Islamic Development Bank) or otherwise (through Lebanese networks, for example). FDI from the Arab world and Iran increased substantially between 2000 and 2008. The role of Islamic banks has expanded with the support of the Gulf States and Iran. Islamic finance represents a potential USD 700 billion on a worldwide scale. Influences are felt through religious means (mosques, Koran schools and madrasahs). Faced with the varied traditions of black Islam (for example, Sufi or Mouride brotherhoods), struggles for influence between Wahhabis, Salafists and Shiites can be seen. Saudi Arabia provides financial assistance and develops Wahhabism in Muslim-dominated countries and regions. The Islamic University of Madinah and financing from the OIC are ways of extending the influence of Arab oil-producing nations. Africa participates indirectly in conflicts in the Near and Middle East, for instance via the role played by the Lebanese diaspora or by enduring struggles of influence (e.g. Israel in Ethiopia, or Saudi Arabia and Iran in Muslim countries and regions). 40In a context of globalisation it is important to take the role of diaspora networks into account with regard to their transnational citizenship. “Subaltern globalisation” (Marchal 2008) is carried across the South by non-governmental organisations and international partnerships between India, Brazil, South Africa and China (Perrot and Malaquais 2009). African diasporas in Europe and America have skills and finances. Indeed, their assets are estimated at between USD 700 and 800 billion, more than the GDP of Africa. The Lebanese (400,000 to 500,000 people in West Africa), Chinese, Indian, Indo-Pakistani (more than 2 million in eastern and southern Africa) and Ismailian diasporas play a decisive role in the involvement of Africa in globalisation. They have considerable economic weight on the African continent while having links to their places of origin (same information system, participation in religious festivals, transfers and even financing of political forces). They are sometimes involved in certain parallel channels (various trafficking activities). 41Analyses of the current and foreseeable effects of these new partnerships draw contrasting conclusions. The emergence of a multipolar world creates many opportunities for freedom and resources for African States that are able to diversify their partnerships. This presents both risks and opportunities for sustainable development. 42On one hand, one could favour the room for manoeuvre that the competition between powers offers. Conditions are relaxed and Africa benefits from infrastructure and development projects and appropriate technology. Emerging powers are, or could be, the motors or the locomotives of African growth. On the other hand, relationships are still largely post-colonial in nature. Africa is still an exporter of non-processed raw materials, and in some instances natural resources are used beyond renewal capacity, pillaged or wasted. In addition, the risks of renewed indebtedness are great. 43Emerging countries are repeating the mistakes of the former colonial powers, even though a normalisation process is under way in the Bretton Woods institutions with regard to financial balancing and debt management. DAC donors have aimed to improve efficiency, coordination, consistency and harmonisation of aid and to make it more freely available. However, these improvements in the cooperation process are called into question by the practices of newcomers who act as “free riders”. Similarly, transparency and traceability measures, such as the Extractive Industries Transparency Initiative (EITI), are rendered obsolete, or at least fragile, as a result of the arrival of new operators who do not play by the same rules. 45The worldwide economic crisis affects the current economic growth in Africa through its influence on three main transmission channels: first, the commercial channel which has shown adrop in demand and prices of raw materials; second, the financial channel which has suffered a sharp decline in private investment, transfers from migrants, ODA and trade credit lines for imports; and third, the volatility of prices and markets which has had a profound effect on increasing uncertainty. A drop of three to four percentage points in African growth is anticipated for 2009. 46The strategic question is to know whether emerging economies will play a role or not in picking up the baton and taking the lead in African development cooperation. Contrasting trends can be seen in the short term. In the timber and mining sectors, where China is a big importer, investors are withdrawing and exports to China are slowing down substantially. On the other hand, in the oil, construction and public works sectors, more offensive strategies are appearing and operators from emerging countries tend to take the places left vacant by the Westerners. China and India will have growth rates of more than six percentage points and will maintain the demand for raw materials. It is estimated that Chinese double-digit growth will ensure African growth of approximately 6% because of the level of Chinese demand for raw materials. 47Cooperation with emerging powers, and with China in particular, alters the cooperation arena. This cooperation is supposed to be pragmatic, differentiating the field of politics from economic interests. It appears to be both in tune with African priorities and less cynical than Western cooperation, which is able to reconcile dialogue on values with practices supporting dictators or lifetime presidents. But at the same time it does not take into account certain fundamental problems in African societies and poses many risks, ranging from renewed indebtedness of the continent to supporting the corruption of “kleptocratic” regimes and a lack of respect for international standards. It risks delaying progress in institutional reform, aid coordination, the responsibility assumed by African decision-makers given budget aid and a greater awareness of global public goods. The question of trilateral cooperation between emerging industrial and African countries is acutely pertinent in a multipolar world. 48After 50 years of independence Africa is still largely dependent on aid and remains specialised in commodities. On the other hand, the global context has changed profoundly and Africa has diversified the range of its partners greatly. The new issues at stake are manifold. 49The challenge is political. Issues of good governance, respect for human rights and social and environmental norms have become priorities. These priorities risk being questioned again by the emergence of new partners who are not particularly interested in them and could by way of unfair competition justify the return to old practices. One can cite delays in the EITI process implementation as an example. At the same time China is concerned by Islamist fundamentalism, the taking of hostages and maritime piracy and it is forced to reconsider its international practices. 50The challenge is also an economic one. It remains to be seen whether there will be substantial technology transfers and an outsourcing of production to Africa, especially with a view to accessing the North American and European markets. The increase in the quality of products and diversification of production suggest that territorial poles of competition are emerging, while the continent participates both in production segments that are integrated in global technical production and in cognitive processes, especially via multinational firms. To exert multiplier rather than enclave effects, this involvement must be closely linked to the local production framework. 51Lastly, the challenge is geopolitical. Africa is concerned by many problems that are global in scope, such as climate change, market instability, epidemiological risks and terrorism. Sub-Saharan Africa, with the exception of South Africa, remains absent from global governance fora, be it the G-20 or the future Group of 14 (G-14), which will include, other than the eight countries of the G-8, Brazil, China, Egypt, India, Mexico and South Africa. Relations between Africa and its new partners are changing the balance of power and alliances within the international arena. Will African countries have a stronger voice? Will they participate in decision-making bodies such as the UN Security Council? Will they increase their quota and their capital share in the Bretton Woods institutions? Will the new G-14 or G-20 fora accept the AU as a full member? The new global governance also plays itself out at the South-South regional level. Afrique contemporaine. 2008. Les trajectoires de la Chine-Afrique. Report. No. 228. Alden, Chris.2007. China in Africa. London; New York: Zed Books. Bagayoko-Penone, Niagalé. 2004. Afrique: les stratégies françaises et américaines. Paris: L’Harmattan. Bal, Marie, and Laura Valentin. 2008. La stratégie de la puissance Chine en Afrique. Mémoire ESSEC Intelligence économique. July. Broadman, Harry. 2007. Africa’s Silk Road: China and India’s new economic frontier. Report.Washington: World Bank. CEPII (Centre d’études prospectives et d’informations internationales). 2008. L’économie mondiale 2009. Coll. Points. Paris: La Découverte. Chaponnière, Jean-Raphaël. 2008. Un demi-siècle de relations Chine-Afrique. In Les trajectoires de la Chine-Afrique. Report, Afrique contemporaine, no. 228: 35-48. Coalition pour l’Afrique. 2005. Prime ministerial report. London. Dupré, Mathilde, and Weijing Shi. 2008. La présence chinoise en Afrique de l’Ouest: le cas du Mali et du Bénin. Working document 69. Paris: French Development Agency. August. ECDPM (European Centre for Development Policy Management). 2009. Trade Negotiations Insights from Doha to Cotonou. Monthly bulletin. Maastricht. Emmott, Bill. 2008. Rivals: How the power struggle between China, India and Japan will shape our next decade. London: Allen Lane. French Embassy in Cameroon. 2008. Les hydrocarbures en Afrique centrale. Note. 10 June. Gabas, Jean-Jacques, dir. 2005. L’aide publique au développement. Paris: La Documentation Française. Garnaud, Benjamin. 2008. Aide au développement et pays émergents. Discussion paper 15. Paris: IDDRI. Guérin, Emmanuel. 2008. Bailleurs émergents: où en est la Chine en Afrique? In Les trajectoires de la Chine-Afrique. Report, Afrique contemporaine, no. 228: 105-118. Held, D., A. McGrew, D. Goldblatt, and J. Perraton. 2001. Global Transformations. Cambridge: Polity Press. Hugon, Philippe. 1997. Economie politique internationale et mondialisation. Paris: Economica. Hugon, Philippe. 2009. Géopolitique de l’Afrique. Paris: SEDES. 2nd ed. Hugon, Philippe, and Charles-Albert Michalet, dir. 2007. Les nouvelles régulations de l’économie mondiale. Paris: Karthala. IMF (International Monetary Fund). 2009. Perspectives de l’économie africaine. April. Washington: IMF. Khanna, Parag. 2008. The Second World empires and influences in the new global order. New York: Random House. Marchal, Roland. 2008. Afrique-Asie: une autre mondialisation? Paris: Presses de Sciences Po. Michel, Serge, and Michel Beuret. 2009. La Chinafrique. Coll. Pluriel. Paris: Hachette. El Mouhoub, Mouhoud. 2008. Mondialisation et délocalisation des entreprises. Coll. Points. Paris: La Découverte. 2nd ed. Niquet, Valérie. 2006. La stratégie africaine de la Chine. Politique étrangère, no. 2. ODI (Overseas Development Institute). 2009. Aid for trade: Assessing impact and effectiveness. Working paper. London: ODI. Perrot, Sandrine, and Dominique Malaquais, coord. 2009. Afrique, la globalisation par les Suds. Report. Politique africaine, no. 113. Politique africaine. 2007. France-Afrique: sortir du pacte colonial. Report. No. 105. Rosellini, Christine. 2005. La répartition de la rente pétrolière en Afrique centrale: enjeux et perspectives. In Le pétrole en Afrique. Dossier, Afrique contemporaine, no. 216: 125-138. Wang, Jiang-Ye, and Abdoulaye Bio-Tchané. 2008. Afrique-Chine: des liens plus étroits; comment tirer le meilleur parti de l’engagement économique croissant de la Chine en Afrique? Finances et développement, March. 1 Donors provide official development assistance (ODA) for varying reasons: solidarity (struggle against poverty, urgent aid), utilitarianism (access to natural resources, presence in protected markets), geostrategic interests (security, conflict prevention, fight against terrorism, management of migratory or epidemiological risks, seeking a voice in international decisions), cultural expansion (defence of language and culture), bad conscience (post-colonial guilt, the white man’s burden) or even developmentalism (reduction of international asymmetry and divergence of trajectories). 2 In 2005 in Gleneagles the rich nations of the Group of Eight (G-8) committed themselves to increasing their aid to Africa by USD 20 billion to achieve the Millennium Development Goals. These unfulfilled commitments were renewed during the Group of 20 (G-20) meeting of July 2009 when worldwide aid increased to USD 110 billion, including many sleight-of-hand expenses (writing-off of debt, expulsion costs for illegal immigrants, etc.). 3 In a globalised context new multinationals (such as the Mexican cement producer Cemex, the Russian oil company Lukoil, the Russian gas company Gazprom, the Brazilian textile company Coteminas and the Chinese manufacturer of electronic equipment TCI) and also the new Chinese, Indian, Indonesian and Malaysian oil and mining companies are taking their places alongside the former oil and mining giants and partake in oligopolistic competition. 4 The majors have the technological advancement and the ability to finance operations, enabling them to maintain a dominant position over the independents and Asian companies. However, this lead risks being reduced, faced with Chinese companies which are making progress on a technological level. 5 Despite the sharp drop in aid that in 2008 reached EUR 6.3 billion (approximately CHF 9.4 billion), or less than 0.4% of the gross national income (GNI), France remains one of the most important donor countries in terms of ODA, in both absolute value and percentage of GNI. French aid continues to be directed mainly towards Sub-Saharan Africa (55% of total aid). More than 30% of French aid is multilateral. The French military presence remained substantial in 2008, with 6,000 men in Côte d’Ivoire, Djibouti, Gabon, Senegal and Chad, not counting the 900 military personnel involved in the Licorne operation and the 2,100 in the EU Force (EUFOR) missions in Chad and in the Central African Republic. 6 During the Cold War the economic policy of France with regard to Sub-Saharan Africa reflected, in Gaullist tradition, the geopolitical importance that Paris attached to that region (French-speaking, votes in the UN, oil interests, fear of communism). The fall of the Berlin Wall in November 1989, the widening of Europe and the acceleration of the globalisation process have led to geopolitical declassification of Africa as well as a certain normalisation of relationships between France and Africa. François Mitterrand’s speech in La Baule in June 1990 (which linked French aid to Africa with democratisation), the doctrine of Edouard Balladur in 1993 (which placed a condition upon French bilateral assistance with the signature of agreements with the Bretton Woods institutions) and the devaluation of the CFA franc in January 1994 are all signs that are perceived to be a “letting go” of Africa, with the former mother country cutting the umbilical cord. 7 This is demonstrated in theInternational Finance Facility, an initiative of the Commission for Africa foreseeing a USD 25 billion increase in aid in the form of a loan reimbursed by the Group of Seven (G-7), and the support of the New Partnership for Africa’s Development (NEPAD). 8 The results of the Lomé Convention are mixed. African countries have not been able to maintain their market share or diversify their production, although they had free access to the European market for 95% of exported agricultural products. 9 The EPAs between the EU and the ACP countries, which favoured trade factors to the detriment of developmental factors, were largely refused when they became due, except by intermediary-revenue non-oil-producing countries which applied the GSP regime and some regional bodies like the Indian Ocean Commission, the East African Community and the Southern African Customs Union (SACU). These agreements, which are supposed to favour fiscal transition and provide stability for trade policies in the long term through regional coordination, presented the risk of opening up too quickly as far as vulnerable economies were concerned. In fact, the signing procedure had a damaging effect on regional integration. 10 The EU is also present in Ituri in the Artémis operation in the DRC, in Chad (EUFOR), in Somalia, in Sudan and in West Africa. The transfer of security to the EU (illustrated by the Recamp programme, for example) allows for the decolonisation of bilateral relations between former colonial powers and colonies. 11 Although the election of Barack Obama to the US presidency on 4 November 2008 has great symbolic value, so far it has not softened the African policy that was implemented by the Republicans. 12 The World Bank released a report in 2007 entitled Africa’s Silk Road: China and India’s new economic frontier (Broadman 2007). The African-Asian “summit” in April 2005 in Jakarta, picking up the gist of the Non-Aligned Movement conference in Bandung, was a symbolic sign of arenewalin the very utilitarian relationships between Asia and Africa. 13 The TICAD, during which talks were held regarding cooperation between Japan, Asia and Africa, strongly accentuated these exchanges. Eight African countries attended TICAD I, which took place in 1993: Cameroon, Ghana, Kenya, Senegal, Tanzania, Tunisia, Uganda and Zambia. In 2008 51 African States were present at TICAD IV. 14 Indian companies have invested in phosphates (Senegal, Tanzania), in telecommunications (Malawi), in road transportation (Senegal) and in cutting-edge sectors, where they can benefit from many comparative advantages (finance, new technologies, scientific research), but most of all in the oil sector. 15 African countries can thereby benefit from concessionary credit granted by the Export-Import Bank of India for economic, social and infrastructure projects developed in conjunction with Indian businesses. In return, Indian companies receive oil exploration permits. 16 In the mid-1970s the Chinese presence was a counterweight to Western and Soviet influences. Beijing relied simultaneously on the socialist countries, the liberation movements and pro-Western dictatorships (Togo, Zaire). Military cooperation agreements were signed with Ethiopia, Tanzania and Uganda. Construction of working-class housing, roads and railways was a dominating factor. China supported the socialism of Kwame Nkrumah in Ghana, Modibo Keita in Mali and Sékou Touré in Guinea. 17 The first Sino-African summit and the Declaration of 12 January 2006 set the guidelines of the Chinese cooperation policy: no interference, tied aid, no budgetary assistance, no requirements in terms of good governance, non-recognition of Taiwan. Some 800 aid projects and 800 multinational companies involve 49 African States. The issues are both economic (access to raw materials and to markets) and diplomatic (voices in the UN). 18 To safeguard its oil requirements, China has forged links with Angola, Chad, DRC, Equatorial Guinea, Gabon, Niger, Nigeria and Sudan, which explains the abstentions during UN Security Council votes concerning Darfur. 19 Sino-African trade reached USD 50 billion in Chinese exports and USD 56 billion in Chinese imports in 2007. In doing so, it exceeded the volume of trade with the US (USD 100 billion), before undergoing a temporary drop in 2008. 20 Some 800 companies established themselves in Africa in 2007, investing USD 12 billion. It is estimated that 10% of China’s FDI is destined for Africa. The big Chinese conglomerates benefit from financing at preferential rates and the guarantees of the Exim Bank of China and the Industrial and Commercial Bank of China (Jeune Afrique, July 2008). This is how a Chinese bank acquired a 20% share of the South African Standard Bank for USD 5.5 billion and how Standard Chartered established itself in Nigeria. 21 One example concerns the rivalry between France and China with regard to the strategic uranium resources in Niger. Areva was forced to modify its contracts to obtain substantial concessions for an investment of USD 1.7 billion, whereas China invested USD 5 billion in oil and uranium. Unlike other organisations, starting with the EU, China did not condemn the referendum of 4 August 2009, which allowed Mamadou Tandja to remain president for life. France stood on the fence between the respect for democracy and strategic interests that justify a realpolitik. Philippe Hugon, « Cooperation: New Players in Africa »,International Development Policy | Revue internationale de politique de développement, 1 | 2010, 95-113. Emeritus Professor of Economics, Paris X-Nanterre; Research Director at the Institut de relations internationales et stratégiques (IRIS) in Paris.